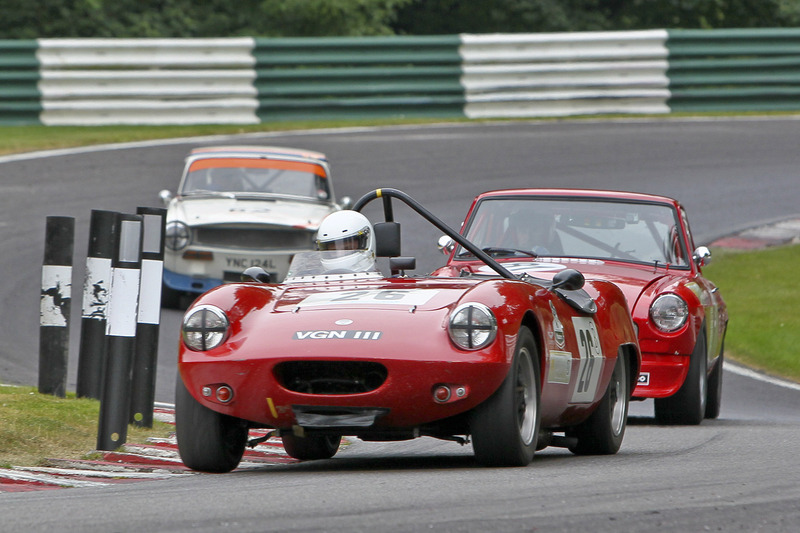 Practice and race for Round 6 of the Motoring Classics Thoroughbred Sportscar Championship was on Sunday 21st July at the pretty Cadwell Park circuit near Lough. Cadwell is quite a narrow circuit and considered a ‘drivers’ circuit and one of the few circuits left where there are still a few viewing areas without large wire fences. A turn-out of sixteen had originally entered but late entries from Peter Barnard and Barry Holmes should have put the number up to eighteen on the day but a pull out by Jonathan Upchurch with pressure of work and Russell McCarthy with a blown engine in the BCV8 practice put the numbers back to sixteen including a one off from Mark Campbell in his beautifully prepared blue TR5. There was a Friday test day and four had arrived to test out their cars in glorious 28 degree temperatures and sort out some niggles. Neil Fowler had a half shaft go so the relaxing Saturday in cooler, damp conditions turned out to be a day of extra sorting out and fiddling and Ken Deamer found some wing repairs to sort out. The entries consisted of six class D, four class C, five class B and one class A. The fifteen minute Qualifying was sixth on the schedule at 10.55am but the weather on the Sunday morning had remained very disappointing as it had stayed Cloudy but with a damp mist in the air. Sixteen drivers left the collection area to Qualify and sixteen finished, Ken Deamer coming in early with a problem and the rest appeared OK although Joe Parrington had gearbox problems. 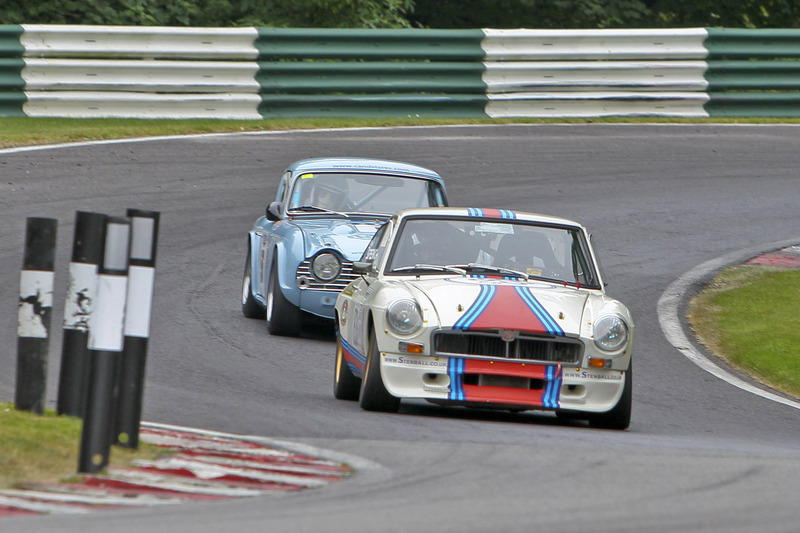 Neil Fowler had changed cars from his V8 that he had parked backwards into the tyre wall in the BCV8 practice but luckily for Neil, Nick, his Chief Mechanic had brought up the MGC so a change-over to race this in the TSCC Championship. Overall and Class C guest Mark Campbell took TSCC Pole on a 1.41.444 who sat alongside Rob Spencer on Class D Pole 1.41.845. Row two Ian Prior on 1.42.585 alongside a vacant Joe Parrington spot calling it a day. On Row three b Class Pole Babak Farsian on a 1.46.578 alongside Barry Holmes on a 1.47.813. On Row four Chris Edwards in his TR6 on 1.48.262 next to Peter Barnard in his Elva on 1.48.292. On row five Neil Fowler in the MGC on 1.49.729 alongside Mark Scott on a 1.51.476. Row six a vacant spot for John Yea (who had come second in the Ecurie but had a head gasket expire before the TSCC race) leaving Paul Khouri alone with a 1.54.586. Row seven Ben White on a 1.54.688 alongside Ken Deamer on a 1.57.721 and finishing the field in the ‘Gentlemen’s spots’ Phil Lambe on a 2.00.042 next to Class A only contender Martyn Clews on a 2.00.948. Lights changed and the field took off with Rob Spencer, Mark Campbell and Ian Prior making a dive for the front, Rob seemed to take the lead with Mark next and then Ian but something happened up top of the circuit and Mark had apparent brake failure and spun out and went into the tyre wall. There were tyres everywhere so an obvious Red Flag incident. However, the race carried on for three laps under the Course Car before the red flag came out. Race Finished on lap three. From the scrutineered seventeen now without Mark Campbell, John Yea, Russell McCarthy and Joe Parrington the grid reassembled with only thirteen. Ten minutes left for the race. Lights went off and Rob Spencer took the lead followed by Ian Prior and Ken Deamer with Peter Barnard and Mark Scott dicing for Class B. Babak Farsian and Chris Edwards fell off on lap one and Phillip Lambe on lap two so the remaining ten made the best of the dimished numbers. Rob and Ian stuck together for all six laps with only half a second between them, Ian unable to find a place to pass and Rob not allowing him to find one. Rob took the flag crossing the line just half a second in front after a great battle. Ken Deamer came home third, a few lengths back and forth Peter Barnard just managed to keep Mark Scott behind although they fought a hard battle, Mark getting the fastest class lap. Paul Khouri the only other B class contender came home nineth overall. 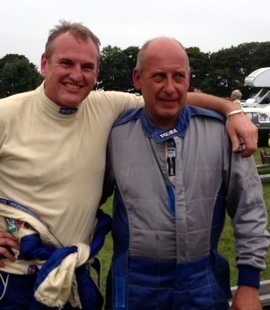 Neil Fowler had a few close laps with Barry Holmes but once Barry had passed he led Neil to the flag. 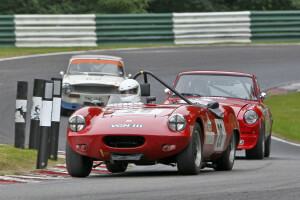 Neil out in his MGC took Class C honours seventh overall now with only Ben White left in the class still on track. Martyn Clews pretty Spriget bringing home the field and Class A. And to MARTYN CLEWS for his Class A Win.